Well here is the star of the Pebble Beach auctions this year (Gooding & Company actually lists a different car, a Ferrari, as their star… but that car is comparatively boring). It’s a Porsche 917K… one of the most legendary of all racing cars. I believe Gooding & Company teased this very car last year and it was eventually pulled from their show. Anyway, it’s back. The original 917 debuted at the 1969 Geneva Auto Show. That car was apparently a beast (if Vic Elford tells you your car is unmanageable at speed, it probably needs some refinement). So Porsche refined it, shortened the car a bit, and christened it the 917K. And it was a beast. It won Le Mans in 1970 and 1971, a few World Manufacturer’s Championships and just about dominated every race it entered. The 917K is powered by a 5.0-liter flat-12 that makes 630 horsepower. This car was originally built as a normal 917 in 1969 but it was more or less destroyed in an accident. When they were working on the 917K, it is believed that Porsche took the frame from the first 917 built and constructed this car. It was painted white and used by Brian Redman and Mike Hailwood as a Le Mans and Nurburgring test car. Jo Siffert bought it from Porsche in June of 1970. And it’s what Siffert did with it that is going to require the next owner to shell out nearly $15 million for it: He loaned the car to Steve McQueen when he was shooting the movie Le Mans. This was one of the camera cars used during that shoot. McQueen would have almost certainly driven this car during the production of the film and the car still has camera mounting points on the frame. 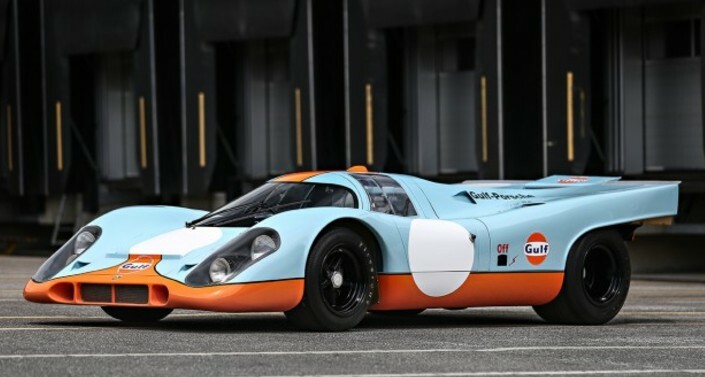 It was under Siffert’s ownership that this car, 917-024, was painted in the iconic Gulf livery and it used by Siffert in Switzerland on the street on at least one occasion! After Siffert’s death, this car was eventually purchased by a French collector and it quietly disappeared. In 2001 it was discovered parked in a Parisian warehouse. Someone managed to buy it and they had it restored. And now, one of the most famous of all Porsches, comes up for public sale. The estimate is a steep $13,000,000-$16,000,000. Click here for more info and here for more from this sale. This entry was posted in Uncategorized and tagged 1970, 917k, auctions, cars, classic cars, gooding & company, porsche, race cars by classiccarweekly. Bookmark the permalink.